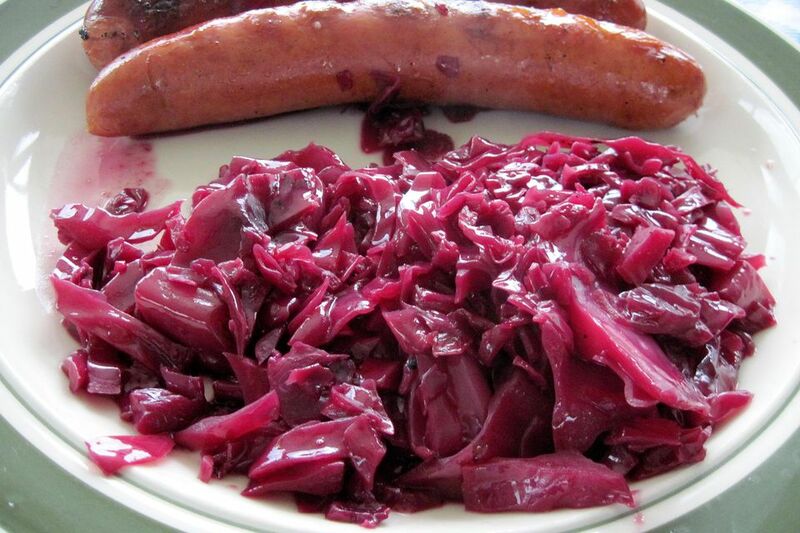 Here is one recipe for German Red Cabbage (Rotkohl) that we make quite often. It is a traditional accompaniment for roast goose or bratwurst and potato purée. This is not made with any flour, so it's wheat free. The red cabbage is cooked (as opposed to a raw red cabbage slaw) and benefits from the flavors of red wine, apple juice, a hint of sugar and cloves. The aroma, while it cooks, is beguiling. Brown 2 1/2 ounces bacon in a dutch oven. Add 1/2 cup diced onion and sauté for 5 minutes. Add 4 cups shredded red cabbage and cook for 2 to 3 minutes. Pour in 1/2 cup red wine and 1/2 cup apple juice to deglaze, add the 1 tablespoon sugar or agave nectar or honey, 1 whole bay leaf, 4 whole cloves, ground black pepper to taste and 1 peeled, cored and quartered apple. Simmer on stove top for 2 to 3 hours, stirring occasionally. Keep the liquids one finger width (1/2 inch) deep, adding apple juice or water. Adjust seasonings. Serve hot. Germans love their cabbage. There are so many varieties and so many ways to use them. Raw cabbage exists in coleslaws (believed to have originated with the Dutch where it is known as koolsla) and cooked cabbage pops up everywhere as a side to pork, beef, and poultry. Even though cabbage is easy to cook, albeit a little time-consuming (but the pot needs little watching), it is sold as a convenience food in jars throughout Germany and through import stores in the U.S.